High-pressure steam leaves the boiler and enters the turbine. 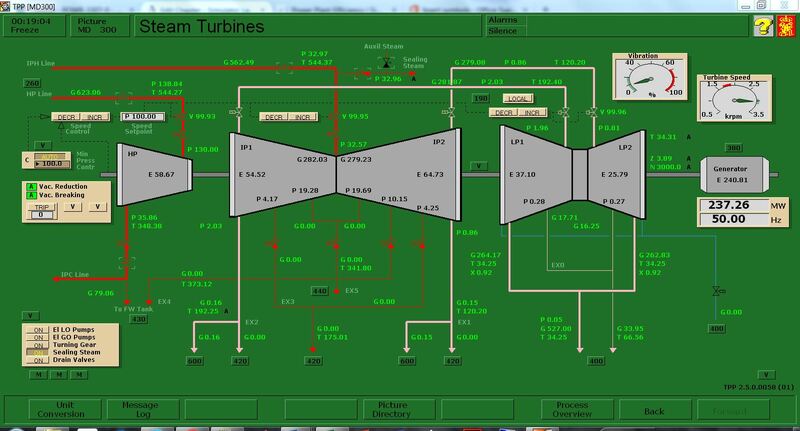 The steam expands in the turbine and does work which enables the turbine to drive the electric generator. The exhaust steam leaves the turbine and enters the condenser where heat is transferred from the steam to cooling water. The pressure of the condensate leaving the condenser is increased in the pump thereby enabling the condensate to flow into the boiler. 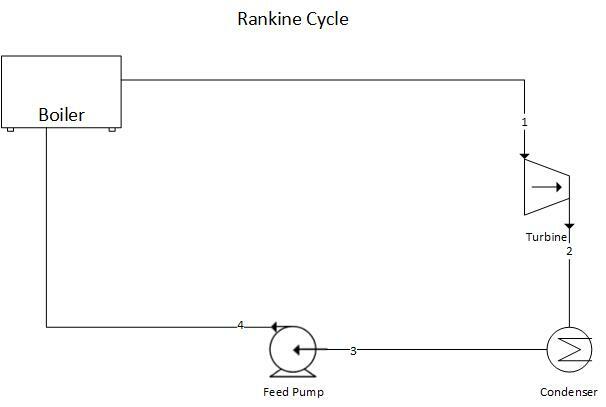 This thermodynamic cycle is known as the Rankine Cycle. Superheating the steam is done by increasing the time the steam is exposed to the flue gases. The result of superheating is that for a given power output, the plant using superheated steam will be of smaller size than that using dry saturated steam. 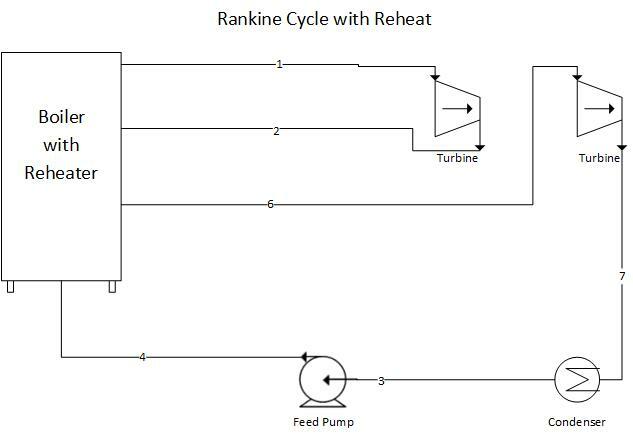 Another variation from the Rankine cycle is the regenerative cycle, which involves the use of feedwater heaters. During the process between states 2 and 2′ the feedwater is heated and the average temperature is much lower during this process than during the vaporization process 2′-3. 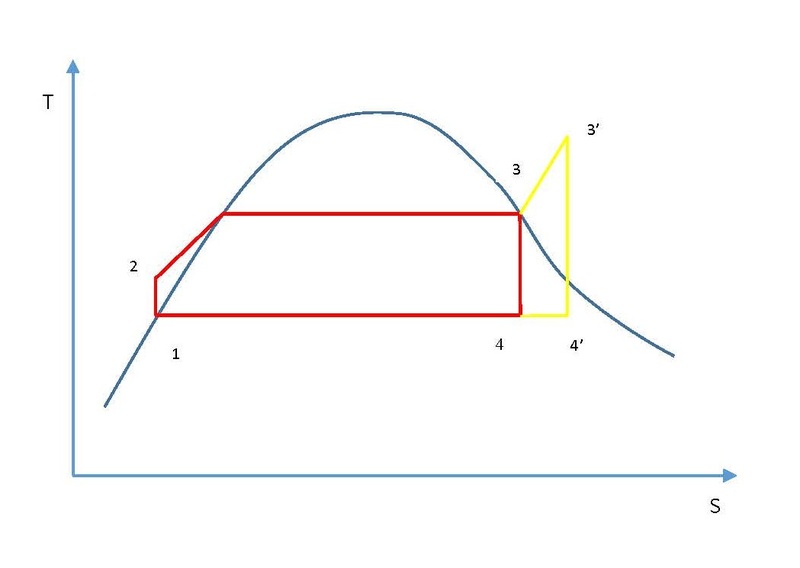 In other words, the average temperature at which heat is supplied in the Rankine cycle is lower than in the Carnot cycle 1′-2′-3-4-1′, and consequently the efficiency of the Rankine cycle is less than that of the corresponding Carnot cycle. 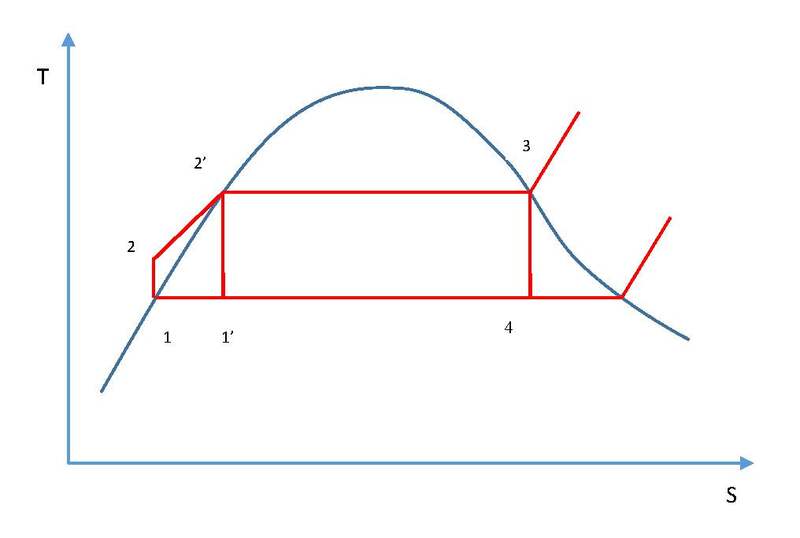 The relationship between Carnot cycle and Rankine cycle is shown below. When all the steam extraction valves are closed (i.e. no regeneration and T00305 set to 10°C). For Boiler Feedwater Inlet Temperature, you may use the Startup Heat Exchanger Feedwater Outlet Temperature tag#: T02447. Computation: Use MATLAB or MS Excel and calculate the overall thermal efficiency of the plant as per Lab Instructions. 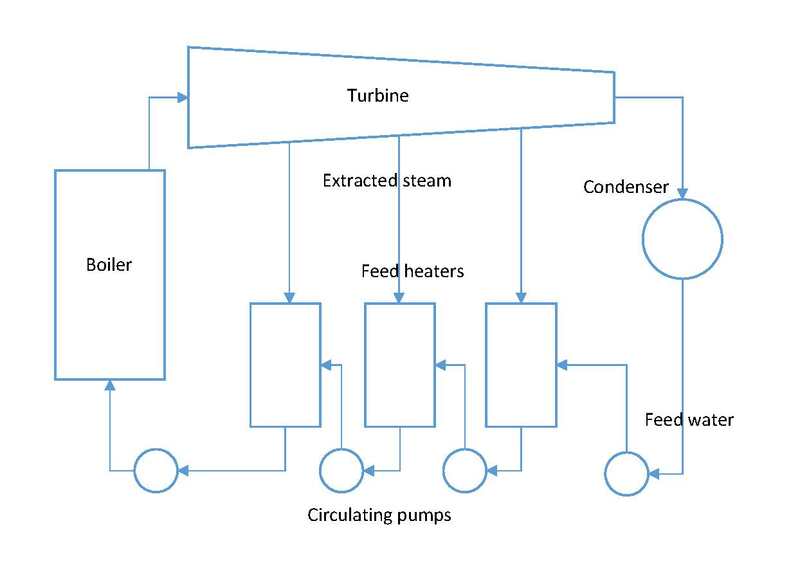 Applied Thermodynamics for Engineering Technologists by T. D. Eastop and A. McConkey: Steam Plant. 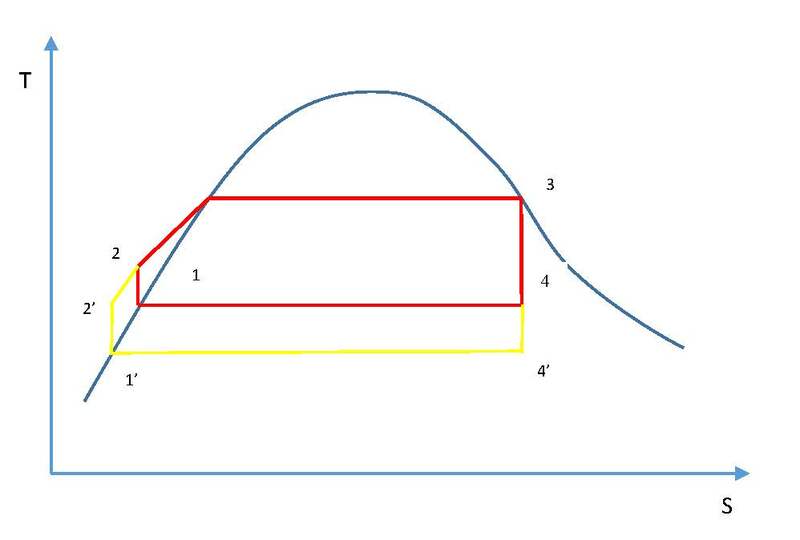 Fundamentals of Classical Thermodynamics SI Version by G. J. Van Wylen and R. E. Sonntag: Vapor power cycles. Power Plant Efficiency by Serhat Beyenir & Sanja Boskovic is licensed under a Creative Commons Attribution 4.0 International License, except where otherwise noted.